Because many states’ public-employee pension plans are currently underfunded—meaning that current assets are less than promised retirement benefits—proposals to drastically reshape public-sector pensions or eliminate them in favor of 401(k)-style retirement plans are expected to once again be introduced this coming year in statehouses across the country. While proponents argue that these alternative defined-contribution plans are good for taxpayers, in most cases taxpayers are better off making relatively minor reforms to the current defined-benefit pension system rather than scrapping it entirely. Why? 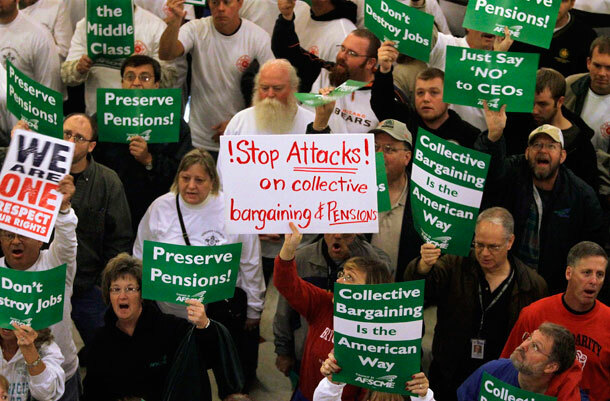 Because the defined-benefit pensions held by public employees are much more cost effective than 401(k)-style retirement plans, costing roughly half as much to provide the same level of retirement benefit to workers such as police officers and firefighters, librarians and teachers, and other public-sector workers. In short, the smart money in any state pension-reform plan would go toward smaller-scale changes. Relatively modest changes to public-pension plans—such as to increase contributions from employers and workers—should significantly correct the underfunding problem that many plans currently face. Adopting best practices—such as requiring states to make annual contributions that reflect their share of plan costs—can shore up most defined-benefit plans for the long haul, and minimize the need for making additional contributions in the future. Eliminating defined-benefit pension plans and switching to 401(k)-style defined-contribution plans will not save money because dollar-for-dollar defined-benefit pension plans are much more efficient. Hybrid proposals that attempt to combine elements of defined-benefit pensions and defined-contribution plans are unlikely to provide short-term cost savings, though they do hold some promise for managing the downsides of both types of plans. Retirement plans come in two basic varieties: defined benefit and defined contribution. No type of retirement plan is perfect. All involve tradeoffs between cost, risk, and retirement adequacy, and all involve different choices about who bears these costs and risks—employers or employees. In short, both defined-benefit and defined-contribution plans have advantages and disadvantages. In defined-benefit plans (often called traditional pensions) the amount of benefit a worker receives upon retirement is defined by the rules of the plan based on a formula that accounts for salary and years of service, among other factors. In most defined-benefit plans for public employees, both the employer and employee makes contributions to the plan, but only the employer assumes the investment and other risks associated with managing the plan to meet the target retirement benefit. In contrast, in defined-contribution plans such as 401(k)s, the contribution by the employer is defined by the rules of the plan, typically a percentage of salary or a match of worker contributions up to a certain limit. The end retirement benefit for the worker is not defined, but is instead determined by whatever is in the account—depending upon contributions, investment performance, plan costs, and withdrawal timing, among other factors. With a defined-contribution plan, employees bear the risk, while with defined-benefit pensions, more risk is borne by the employer. 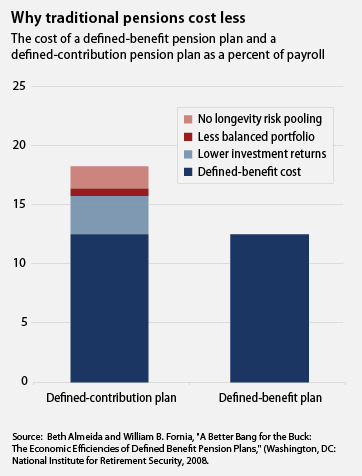 On most measures, defined-benefit pension plans stack up quite well. Taxpayer cost is the metric at the center of the debate, so we’ll focus on that, but it is worth noting that defined-benefit plans also have significant benefits for workers and their employers. Studies show that workers with defined-benefit plans have significantly higher standards of living in retirement, benefiting from both the money and the security of the monthly checks that the defined-benefit plan provides, and are much less likely to be in poverty during retirement. Similarly, pensions help reduce employee turnover and thus boost worker productivity. These human-capital benefits may be especially important in the public sector with a large percentage of careers such as teachers, firefighters, and cops involving large training expenses that employers are only able to recoup by minimizing turnover. For any given level of retirement benefits, defined-benefit plans are less expensive than 401(k)-style defined-contribution plans. That means that in order for workers to retire with, for example, 75 percent of their pre-retirement income (the level recommended by many retirement planners), it is cheaper to do so with a defined-benefit pension plan. The same holds with any other level of retirement income. That’s because defined-benefit plans have higher returns, more balanced portfolios, and greater ability to pool risk. All told, defined-benefit plans cost about half as much as defined-contribution plans to provide the same level of benefit due to these effects, according to research by the National Institute on Retirement Security. Defined-benefit plans achieve these cost savings because of the way they are structured as a large, diversified, professionally managed investment fund, with the ability to maximize returns over a long time horizon. Defined-benefit plans average higher investment returns in part because investment decisions made by professional investors are more likely to be wiser investments than those made by ordinary workers. Individuals have to become more conservative when investing as they age because they have less time to recover any possible losses (resulting in lower returns) but individuals often do just the opposite (depleting their savings). These pension plans also have the ability to pool investment risks over a longer time period and a greater number of people compared to a defined-contribution plan. When accounts of both older and younger workers are pooled together, the fund manager can shoot for a higher return as the plan has a much longer investment time horizon. One study of the difference in returns by the global benchmarking firm CEM Benchmarking Inc. finds that between 1998 and 2005 defined-benefit plans had annual returns 1.8 percentage points higher than defined-contribution plans. Over time this seemingly small difference can be significant due to compounding growth. Over 30 years a 1.8 percentage point difference would result in about a 70 percent larger retirement fund. Defined-benefit plans also need only to accumulate sufficient funds to pay for the average retiree’s lifespan in the plan, taking advantage of their ability to pool longevity risk across all retirees in the plan. In contrast, an individual with a 401(k) has to save an amount sufficient for their maximum life expectancy: Saving only enough for the average lifespan could leave them without sufficient income in their later years. Some argue that public-sector defined-benefit plans are also less costly than defined-contribution plans because they have lower fees. Although such public-sector plans certainly have lower fees than the typical 401(k), it is likely that a large public-sector defined-contribution plan could achieve similarly lower fees. That means the cost difference between both types of public-sector plans is due to retirement-plan design. Defined-benefit plans are simply much more efficient and cost effective than defined-contribution plans. Because defined-contribution plans are more costly, the only way these plans can save money compared to a traditional public-sector pension is if it provides less to workers and retirees. Even for those who argue that public-sector workers should have lower levels of retirement benefits than they currently do, it would be more cost effective to provide this lower level of benefit through a traditional pension. The bottom line: The level of retirement benefits that public-sector workers should receive is really a separate issue from whether that benefit is provided through a defined-benefit plan or defined-contribution plan. Still, both types of pensions are not without a downside. For the taxpayer, the primary concern with a defined-benefit pension is that required contribution levels can vary—meaning additional contributions can be required during tough economic times, when money is tight. On average, defined-benefit plans require a lower level of contribution to provide the same benefit as a defined-contribution plan, as discussed above. But when the pension fund’s investment return drops significantly for a few years, which often happens during a down economy, additional contributions can be required to bring the plan into balance. These additional contributions can come from workers or the government, or some combination of the two, as is often the case. Of course, the reverse is also true—when pension-fund investments do very well, lower levels of contributions may be required. In contrast, taxpayers will not have to make any additional contributions in a down economy with a defined-contribution plan. That’s because these plans shift the risk of reaching a target asset level to the worker. In this scenario, workers will either make extra contributions or have a lower standard of living in retirement. From the taxpayer’s perspective, extra contributions during a down economy are a concern because they may require higher taxes or divert funds away from other priorities. Still, spread out over a large number of citizens, these extra contributions may be relatively small, especially when workers also make additional contributions. And, on average, taxpayer contributions are less than they would be with a defined-contribution plan because defined-benefit plans are more efficient. Further, public-sector defined-benefit pension plans are generally set up to bear this contribution-timing risk fairly well. Public-sector pensions have a large number of workers and taxpayers to pool risks among, and long time horizons. They also have significant assets with sufficient funds to meet needs for many years, which can provide some flexibility over how fast the plan needs to catch up to full funding levels. In contrast, each worker manages his or her own individual defined-contribution account, which has much fewer assets, a shorter time period to reach desired asset levels, and only one worker to bear the risks. Many state defined-benefit pension plans are not 100 percent funded, with the average a bit less than 80 percent. This means current assets are not sufficient to pay all promised benefits. For most of these plans, their level of shortfall does not present an immediate crisis, but rather is a problem with a long time horizon. At the current level of shortfall, the typical state defined-benefit pension plan can afford to pay 100 percent of benefits over the next 15 to 20 years. While the current level of shortfall is a serious issue, some estimates of the shortfall are overblown. Some conservative critics of public-sector workers and their defined-benefit pensions claim that public-sector pensions face a shortfall of $3 trillion, but estimates based on Governmental Accounting Standards Board guidelines put the shortfall around $700 billion. The primary cause of most of this shortfall is the weak returns of these pension funds, something caused by the collapse on Wall Street, not the design of defined-benefit pensions. To be sure, there are egregious cases of pension plan abuses that must be dealt with, but in general, as a McClatchy Newspapers article put it, “[Pensions are] underfunded, in large measure because—like the investments held in 401(k) plans by American private-sector employees—they sunk along with the entire stock market.” Indeed, in 2000 state and local pensions, in the aggregate, were funded at 100 percent of future liabilities. If pensions had earned a return the same as a 30-year Treasury bond over the three years (about 4.5 percent) since 2007, then current assets would be larger by about $850 billon, or just about enough to fill the shortfall. States have also cut back on (or entirely avoided) making regular contributions to their employees’ defined-benefit pensions, increasing the shortfall by approximately $80 billion. Many states didn’t make all necessary contributions to pension plans when the stock market was booming, assuming the good times would go on forever, and when bad times hit, they have also failed to make necessary contributions. According to the Center on Budget and Policy Priorities, state government contributions to public-sector plans fell sharply during the period of high stock market returns, dropping from 9.6 percent of payroll in 1997 to 6.5 percent in 2002 (or 2.6 percent of total budgets). The upshot: Critics of state defined-benefit plans are claiming a short-term shortfall caused by a large recession requires moving to a more expensive system that will cost more in the long run. This issue brief isn’t geared to provide specific advice for any specific state government public-sector pension plan, but we can provide some general guidance as state legislators grapple with pension reform. First, relatively modest changes to existing defined-benefit pension plans, such as to increase contributions from employers and potentially workers, should significantly correct the underfunding problem that many public pensions currently face. To give an idea of the scale of reforms needed, even before accounting for reforms that occurred in the past year, estimates indicate these pensions would become solvent if state governments increased the funding by approximately 1.2 percent of their budgets or alternatively 0.2 percent of state domestic product —the total value of goods and services produced in the state—over the course of 30 years assuming no change in benefits. And because most state defined-benefit pension plans have more-than-sufficient assets to pay benefits for decades, changes that are especially tough to make in today’s budget climate, such as to increase government contributions, can usually be phased in over a period of time. Second, there are a number of simple steps that will shore up defined-benefit plans for the long haul and minimize the need to have to make additional contributions. Adopting best-practice reforms can ensure that defined-benefit plans more easily weather future storms, even ones like the Great Recession of 2007¬–2009. The National Institute for Retirement Security conducted an analysis of public-sector defined-benefit pensions that remained well funded despite two severe economic downturns that should serve as a starting point. Their recommendations include requiring annual contributions from employers, actuarially valuing any benefit improvement before adoption, closely evaluating cost-of-living adjustments, implementing “anti-spiking” measures to prevent techniques that can result in significant pension increases for some individuals, and reasonable assumptions for inflation and investment returns. Similarly, the Pew Center on the States argues that mandating that states make annual contributions, as a number of states already do, rather than occasionally taking missing payments is the most important long-term reform, arguing “[t]he make or break factor for keeping a retirement system well-funded is to pay the actuarially required contribution consistently.” Our colleague Christian Weller also argues for the importance of making governments annually pay the required amount. Third, eliminating these defined-benefit pension plans and switching to a defined-contribution plan will not save money. It will cost extra money in the short run. Obligations to the existing public pension plan would remain because public-sector employees in most states cannot be forced to leave their current pension plan due to state constitutions and common law. Any state would need to run two retirement plans simultaneously, which would increase administrative costs. The costs of the defined-benefit plan, which would primarily be for retirees instead of a mix of younger and older workers and retirees, would become more expensive because its investment strategy would need to become more conservative. Any potential long-run savings from such a switch would come from providing lower benefits—something that could be done more cost effectively by making adjustments to the existing pension plan. As a result, switching to a defined-contribution plan now—when state budgets are especially tight—makes little sense. Fourth, public-sector hybrid proposals, which typically add on a defined-contribution plan to a slightly reduced defined-benefit plan, don’t provide short-term cost savings. Obligations to the existing defined-benefit plan remain, even as costs of the new plan are added. Indeed, according to actuarial analysis, the newly adopted hybrid plan in Rhode Island does not provide cost savings compared to the existing defined-benefit plan. Cost savings are achieved from the “change and suspension of the COLA [cost-of-living adjustment] and deferral of the retirement age”—changes that are under legal challenge because reducing expected benefits for current employees may constitute breaking a contract. Still, in the long run, hybrids hold some promise for states because they can provide an interesting compromise for taxpayers between the cost advantages of a defined-benefit plan and the predictability of a defined-contribution plan. Hybrids can’t completely take away the downsides of either type of plan. Most versions still have the potential for requiring additional contributions when investment returns are down for a period of time. Hybrids also can’t solve the higher costs of 401(k)-style plans. But hybrids can potentially lessen these concerns by providing a different set of risks and costs for taxpayers than pure versions of either type of pension plan. In short, hybrids can potentially help states manage the downsides of defined-benefit and defined-contribution plans. There are a number of interesting hybrid models to consider. The Federal Employees Retirement System enrolls workers in a modest pension as well as a defined-contribution plan. There is also a hybrid model adopted by many Dutch employers that spreads management responsibilities and risks more broadly than traditional defined-benefit plans, and a hybrid plan from Alicia Munnell of the Center for Retirement Research at Boston College and her co-authors that provides a defined-benefit plan up until a certain income level and then a defined contribution beyond that level. Defined-benefit pensions are not a perfect retirement system for state-sector workers, but then again, neither is any retirement plan. All retirement plans involve tradeoffs about risk and cost. Still, considering the various tradeoffs, public-sector defined-benefit plans do fairly well for taxpayers by providing a more cost-effective way to ensure a level of retirement security for public employees. Though public pensions currently face funding shortfalls, relatively minor tweaks can help close that gap. Other options, such as switching to 401(k)s, would not reduce costs for taxpayers. As a result, the way forward for most public-sector defined-benefit plans is through reform, not replacement. David Madland is Director of the American Worker Project at the Center for American Progress Action Fund. Nick Bunker is a Special Assistant with the project.